Experience Nashville by Night as the city lights will illuminate the sky. This 90-minute tour is on one of our Traditional Historic Trolley's and will stop at 6 different locations for you to hop off and capture some beautiful photos along the way. There is nothing like seeing the Music City all lit up with the ability to hop off for some amazing photos. Our Night Time Tour of Nashville will be on one of our traditional trolley's and will be an entertaining and informative tour with one of our experienced professional guides, as they whisk you through the beauty that is the Music City at night. Our tour allows for quick hop off points at 6 different locations throughout the city. 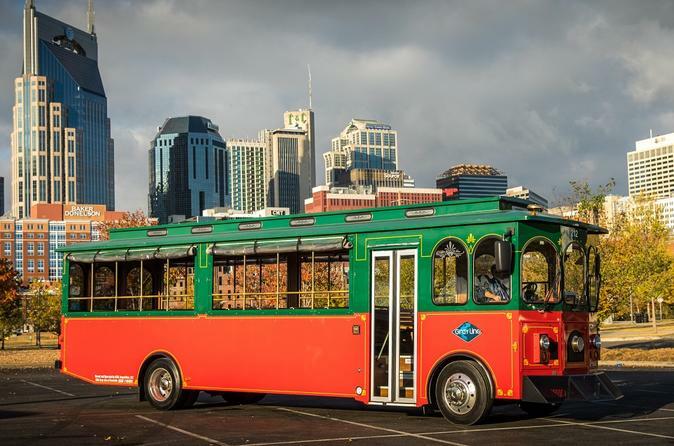 You can hop off the Trolley and capture some of the beautiful photos of Nashville before hopping back on and learning about Nashville's unique history on the way to the next location. It's perfect for getting those quick Instagram photos as the city lights will illuminate the sky. Throughout the evening you will experience stops at some of the most memorable and captivating sites that Nashville has to offer. See breathtaking views of Nashville's Skyline, the Parthenon, The Tennessee State Capital Building, Bicentennial Mall, Downtown Broadway, and more!